Chalet Mukashi Mukashi is set in a charming forest landscape of the serene Hirafu Village. The chalet design makes it appear as though it is a sanctuary with impeccable architecture perfectly blending into the stunning scenery in Niseko. Visitors can carry as many friends and relatives as they wish because the establishment provides six ensuite bathrooms. You will probably want to spend all year at the chalet especially if you are a nature person. Bedrooms feature dramatic panels of floor to ceiling glass as well as walls. These create the perfect space for natural light to penetrate through. Views make it feel as though one is in touch with nature. It boasts of minimalist indoor designs that are modern giving more focus on the snowy or green scenes that are not inside the loving home. The kitchen features white walls and has an enchanting futuristic feel. The open-plan cooking area also doubles up as the dining section with a wooden table and a flat-screen TV. It implies that guests can enjoy their meals as they catch up on the new, their favorite shows, or some music. Chalet Mukashi Mukashi also presents a quiet and sophisticated lounge area. It also takes pride in a modern gas fireplace that has a wall of glass separating it from the lounge area showing off authentic design quality. The chalet is child-friendly with a kid’s room that comes with a double bunk bed. 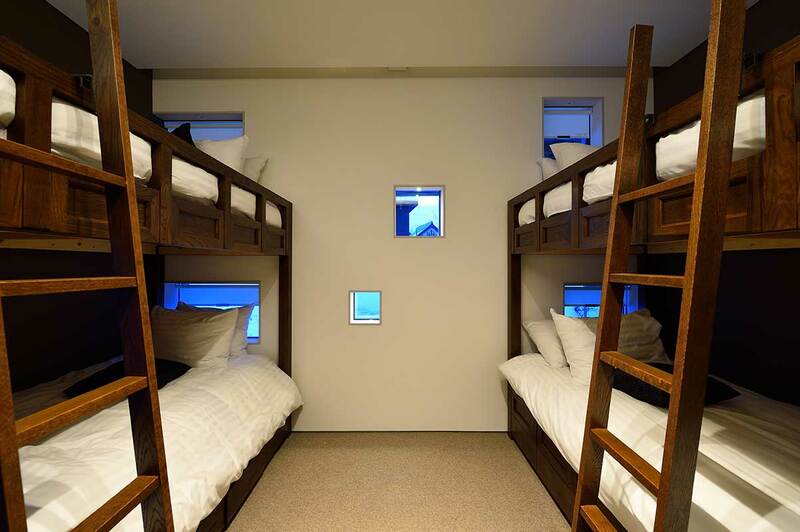 Your nanny will also have a place of their own that also has a bunk bed. Groups can even spend quality time in the vast entertainment and a media room that is ideal for watching the latest movie on one of the biggest flat-screen TVs you will ever lay your eyes on. The place comfortably seats 16 people. Product Description: Chalet Mukashi Mukashi is set in a charming forest landscape of the serene Hirafu Village. The chalet design makes it appear as though it is a sanctuary with impeccable architecture perfectly blending into the stunning scenery in Niseko. Send an inquiry about Chalet Mukashi Mukashi, Niseko.